We are what we eat and this event will introduce you fine, back to basics organic food in an amazing environment where you can actually eat within view of where it was grown. The retreat is a focussed wellbeing resort that has a farm growing organic produce for the restaurant. 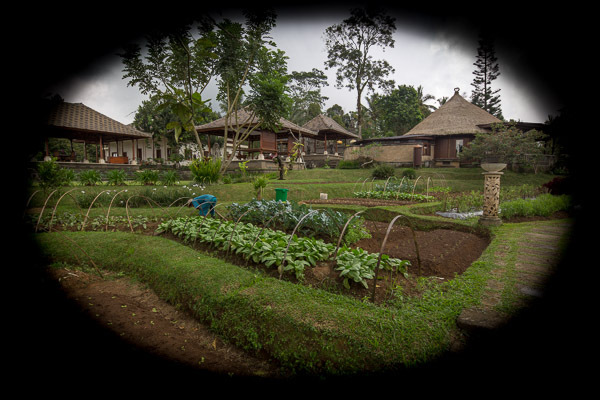 Eat healthily, take a Balinese cooking lesson, see how the Balinese grow organic food. The restaurant is cooled by natural breezes, with spectacular view of the river valley, gardens and Mount Agung, and provides the freshest products, blended with fresh herbs and spices for a scintillating and unforgettable dining experience. A daily menu is specially designed to offer a wide range of healthy options. An unforgettable evening awaits you with a fine selection of Indonesian and International dishes and wines. Among the specialties is Rijstafel (in English “Rice-table”). It is a composition of Indonesian delicacies served to Royalty. For many visitors it is an opportunity to sample a variety of Indonesian dishes. Special diets are available and can be tailored to individual needs, e.g. weight reduction, digestive disorders etc. All vegetables are organically grown on the retreat farm, observing strict ecological principles. The Poolside Cafe offers complimentary cool towels and fresh fruit in the afternoon. Enjoy cocktails and fresh juices, lunch and snacks as you overlook the “Valley of Enchantment” where the Jati River and waterfall provide a private location for meditation. Alcohol is served on the premises but we ask participants to find balance between cocktails and yoga! 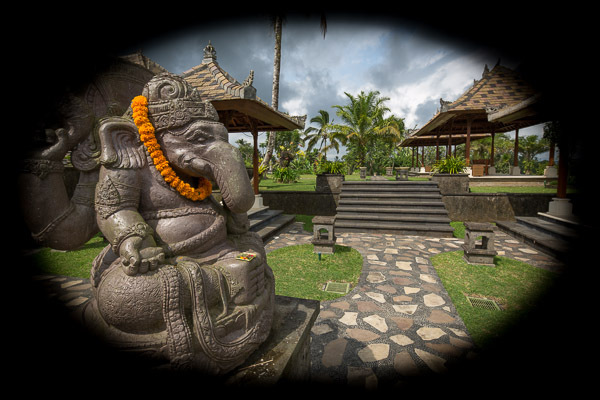 Welcome to the spiritual you, Bali is renowned for it’s culture where the vibrations of the physical & spiritual are in sync. Re-connect yourself through Yoga, Meditation & Temple visits. Adventurous? Questing? Interested in Cultures? The Jati area encourages wandering in rural rice fields, volcanos, temples, waterfalls and the heart of Bali’s art community. We’ve co-ordinated with the wellbeing retreat for daily activities that offer an insight into the culture and in keeping with our commitment to your total wellbeing, offers yoga, nature walk and Aqua Aerobics – included in your package. For those interested: it is possible to share a part of Balinese Hinduism culture with daily custom of preparing simple offering. After making “Canang”, you may take your offering to the hotel temple with Balinese staff. Local Balinese instructors will guide you through this simple relaxing technique of visualization, allowing you to better understand this stress release technique of how to still the mind. Mentor Fiona will give you tips for destressing and relaxing. 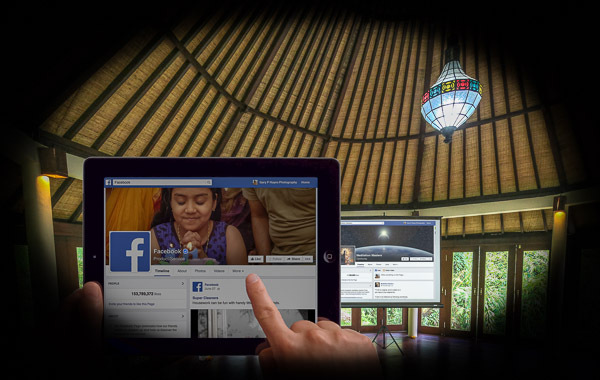 Enjoy the nurturing and harmonious atmosphere of the retreat’s specially designed Yoga / Meditation Pavilion. In this unique space, where walls open up to a natural bamboo forest, immerse in oneness with Mother Nature, while practicing Yoga, Pilates and Meditation with Local Balinese yoga instructors. Our very own Fiona offers EatPrayTweet participants one-to-one private instruction as well as group classes in fitness and core strengthening. Synchronize inner peace with the rising or setting of the sun to enjoy a memorable experience. Social media is changing the world: be part of that change. Setting a social media strategy is critical for success. Learn the strategies not just the tools/channels such as Facebook and Twitter by setting Purpose, identifying and communicating and measuring Key Influencers and gain a better understanding of connecting to community and engagement. Explore blogging and Big Data and social media analytics -learn how to set KPIs (Key Performance Indicators) and measure your social media objects. The biggest issue facing social media is time and resources. Whereas Bought Attention takes money, Earned Attention requires content, time and human resources. Managing time and resources is critical to social media success – find the apps that give you time management in both social media and your everyday work. You’ll even learn tools for automating (safely!) social media updates so you can take more time for other important things in your life. Wellbeing is all in the balance of work, play and social.